Rimen & Co. brings you an exclusive collection of handbags. This handbag is definitely a trend setter with will stand out wherever you go. This handbag comes in 6 different colors: Red, Brown, Khaki, Blue, Beige, and Black. Made of PU Leather with high-qualified hardware parts makes this bag noble and the unique design highlight feminine elegance. It's shopping and dating's good partner. Have phone/ID card/Key pocket inside, can fit wallet/Ipad/Umbrella/Spectacle Case. About US Our mission is to offer our customers with extraordinary value of exceptional selections from cute bags, messengers, Messenger Bags, cross body bag, shoulder bags, totes, hobos, satchels, bag in bags, woven, structured and functional bags to fashionable bags with studs, rhinestones, laser cut detailing and more..... Our incredible design team works very hard to keep up with the latest trend, design and styles. Dear Buyer : Thanks for your business! Your positive feedback will be greatly appreciated! If you have any questions, please don't hesitate to contact us directly. We will always strive to put our 100% to resolve your issue and delight our customers. Note: Since the item is measured by manual measurement, the size of the actual item you received could be slightly different from the size we listed on website. Meanwhile, please be reminded that due to lighting effects/ environment, monitor's brightness / contrast settings etc, there could be some slight differences between the color tone of the pictures and the actual item. 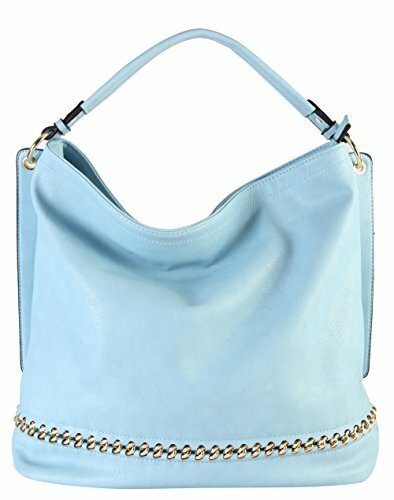 PU Leather Accented Metal Chain at the Bottom Hobo Bag. Approximate Size info: Length 14" x Width 6" x Height 14" Material: PU Faux Leather. If you have any questions about this product by Rimen & Co, contact us by completing and submitting the form below. If you are looking for a specif part number, please include it with your message.